Bucksmore Homelingua prides itself on the high quality and academic standards of its courses, teachers and operations. All teachers are monitored and inspected by the Bucksmore Homelingua head office team. We do not use third party agents or non-head office staff to do this. We are committed to delivering home tuition programmes of the highest possible standard. As such, we are accredited by the British Council, an assurance of quality to international students who are taking or planning to take an English language course in the UK. Bucksmore Homelingua is also a member of English UK. Teachers are required to have a university degree or level 6 on the national qualification framework (NQF) and have either a University of Cambridge CELTA or Trinity College of London teaching qualification. We also employ Postgraduate Certificate of Education (PGCE) teachers that either used to work in schools and international schools or are currently actively teaching. Only 10% of teacher applicants successfully become an active Bucksmore Homelingua teacher. All our courses are monitored by the Director of Studies to ensure a high level of academic quality and student satisfaction. Every year many students return to Bucksmore Homelingua for a second or third course and students rate our courses highly satisfactory. To read what our students think of Bucksmore Homelingua course, visit our student testimonial page. Bucksmore Homelingua’s English language home tuition courses in the United Kingdom are accredited by the British Council. Bucksmore Homelingua is a member of English UK. English UK is the national association of accredited ELT centres. English UK is the world’s leading language teaching association with over 400 members – all accredited by the British Council – including private language schools, educational trusts and charities and language centres in further education colleges and universities. Bucksmore Education was founded in 1979 and since then it has been nominated and won several education awards and competitions. Bucksmore Young Leaders has been nominated in the category for ‘Innovation in Learner Resources’. 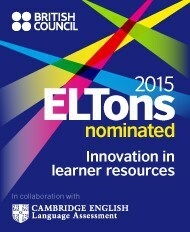 The ELTons (English Language Teaching Innovation Awards), are the only international awards that recognise and celebrate innovation in English language teaching (ELT). They reward educational resources that help English language learners and teachers to achieve their goals. Applications were submitted online last November and they are judged by an independent panel of ELT experts. We are delighted to announce that Bucksmore Education has been appointed as a Centre of Excellence by the EL Gazette www.elgazette.com We are delighted that our excellent British Council inspection results have been recognised by the leading industry newspaper. Bucksmore Education received a Silver Award in the Best Education Product category in recognition of the Bucksmore’s high academic standards and operations. The British Youth Travel Awards awards are managed by BETA (British Educational Travel Awards).